Tonight’s wine was the 2009 Hugel Riesling. It had a Diam closure, clocked in at 12% alcohol by volume, and retails for somewhere between $15-$19. 1.) You can always count on Hugel to be a good bet for the money when you are faced with the (often confusing) Riesling wine section of the store. That goes for their Gewurtraminer and Pinot Gris as well. I’ve purchased it many times. 2.) 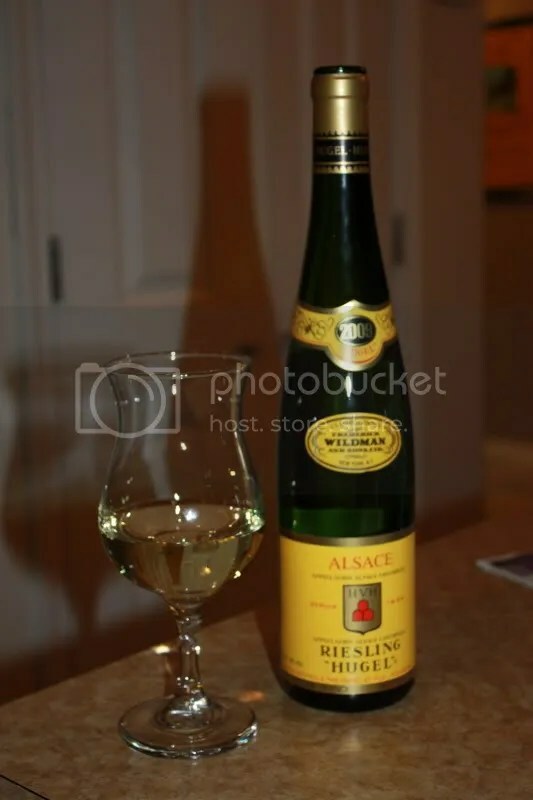 Riesling is what I consider a “gateway” wine to move folks who have always been only Pinot Grigio or Chardonnay people into different wines. 3.) My mom liked this wine. She doesn’t like wine at all. 4.) We drank it with roast chicken. Sort of like turkey, which is often recommended for a pairing with Riesling. I made a simple roast chicken rubbed with butter and sprinkled with Kosher salt. Yum. On the nose I got lemon, white pepper, honey, honeysuckle, flowers, and pear. In the mouth I got lemon, pear, honey, and honeysuckle. The citrus and pear flavors dominated the palate whereas the honey/honeysuckle aromas were more prevalent on the nose. With good acidity and clean flavors, the wine made a great match with the roast chicken and mashed potatoes. *Disclaimer: I received this bottle as a sample from Bin Ends Wine in order to participate in the F. Wildman Twitter Taste Live. I’ve had Hugel wines before. In fact, we did a Hugel Twitter Taste Live ages ago. I’ve also purchased further bottles because I liked what I tasted the first time so much and the entry level wines are always consistent QPR in my humble opinion. But I think something was wrong with this bottle. I know when we were tasting during the TTL Joe also found some off notes in his bottle. 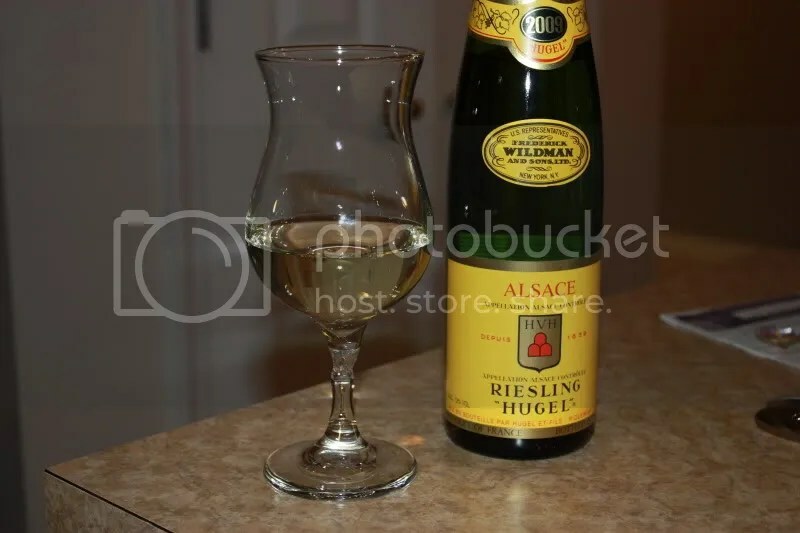 The Hugel for the evening was the 2007 Hugel et fils Riesling. It clocked in at 12% alcohol by volume, had a Diam closure, and retails for around $17. The nose showed as woody, dusty, and earthy with a very little bit of citrus hiding out. After it warmed a bit some flowers and white peach came through, but it still had this overwhelming dirty earthy thing going on. I’m pretty sure this is not the right set of notes for this wine. The mouth showed better, I got lemon, some peach, tangerine/oranges, pineapple, and stones. But still–I think this is supposed to have crisp apples and other stone fruits. I’m pretty sure they carry this wine at the Total Wine & More near my house, so I’ll pop in over there soon and get a new bottle to compare. Ah, the last of the Hugels. I’ve written about the other 3 bottles we tasted for Twitter Taste Live, so it’s time to round that out with the fourth Hugel wine from the Bin Ends Wine tasting. While this is the last wine I’ll write about, we tasted it second the evening of the Twitter tasting. 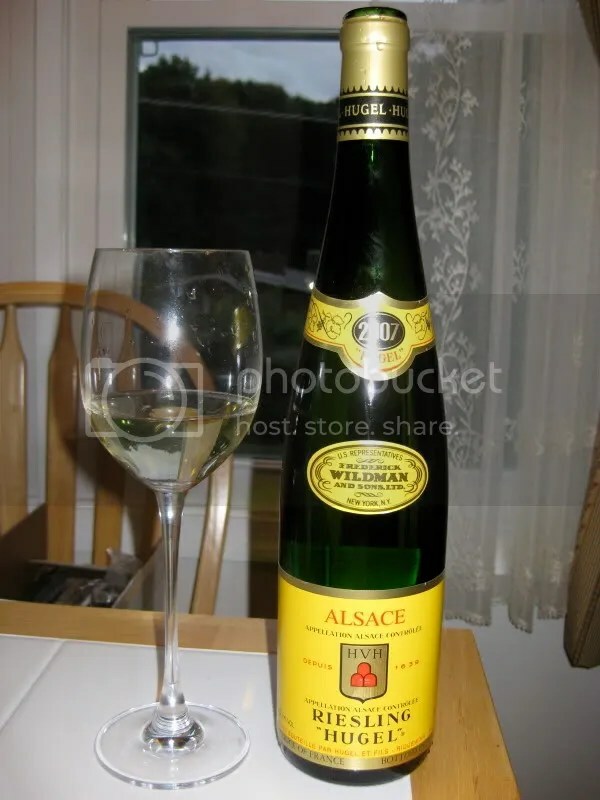 The 2005 Hugel Gewurtraminer may have been my favorite of the “regular” level Hugel wines that we tasted that evening. It either had Diam or a real cork, clocked in at 13% alcohol by volume, and you can purchase it for around $17. In the glass, this Gewurztraminer showed as a very pale, almost translucent color with just the slightest tinge of a straw color. You shouldn’t be fooled by the pale color on this one though, the aroma just wafted across the room, huge! I found lychee, ginger, mango, bread fruit, spice, and roses. Just a gorgeous perfumed nose. In the mouth, I got flavors of white pepper, orange, lychee, ginger, and honey. Overall, I would describe this wine as dancing in the mouth and quite alive. I found the wine refreshing, fun, and very tasty. This could easily be a go-to wine at the price point, and would make a really good Thanksgiving wine. *Disclaimer: I received this wine as a sample from Bin Ends Wine so I could participate in the Twitter Live tasting. We drank this bottle back in August as part of the Hugel Twitter Tasting Live with Bin Ends Wine. I’m a bit late in getting around to reviewing it, but at the time didn’t want to overwhelm everyone with 4 posts in a row about wines from the same producer! 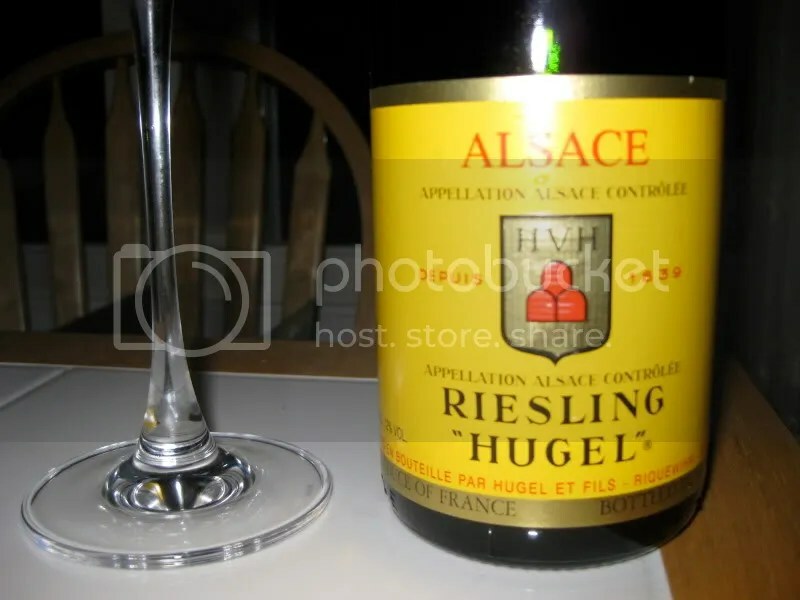 Scheduled as the 2nd bottle of the evening, we drank the 2005 Hugel Pinot Blanc over the course of 3 nights. It clocked in at 13% alcohol by volume, had either a real cork or a diam closure (can’t remember and didn’t write it down), and looks to retail for around $15. In the glass, the wine appeared to be paler than the Gentil, the first wine of the night. On the nose I found fig, spice, pepper, flowers, limes, lemon, grapefruit, stone fruit, and stone. The nose seemed light and quite delicate. In the mouth I got flavors of lime, wet stones, stone fruit, pears, peaches, and minerals. Overall, I found the wine to be crisp, very refreshing, and excellent at the price point. I think this struck me as the most fruit driven wine of the night. *Disclaimer: I received this wine as a sample from Bin Ends Wine for the Twitter live tasting. The fourth and final wine (we’re going a little out of order here…) that I tasted during the Bin Ends Wine live Twitter tasting was the 2004 Hugel Riesling Jubilee. It had a real cork closure (dhonig, I’m sure this one was one of the real corks! ), clocked in at 13.5% alcohol by volume, and runs about $49 from Bin Ends Wine. This was easily my favorite wine of the evening, though, I’d probably be more inclined to purchase the Gentil or Gewurztraminer given the price point. My first note on this wine was: “Like nothing else I’ve ever smelled.” And that’s the truth. The wine had an aroma like no other wine. The nose showed peach, lime, flowers, fig, vinyl, green apple, caramel, a hint of petrol, and lemon. I would love to smell this wine in another 5-10 years. I imagine it will be nothing short of amazing. In the mouth I found lemon, peach, minerals, stone fruit, tropical notes, honey, green apple, banana, and lemon. Overall, this wine was something amazing. I’ve never had another wine like it. I just finished the bottle 4 days after I opened it, and I did nothing but stick it in the fridge with the cork in it. It still showed really well. I’m impressed. The wine was tart, with some residual sugar, but not sweet or overpowering in any way. It had great acidity and a wonderful mineral finish. I’d recommend picking up some of this wine and socking it away for at least 5 years. *Disclaimer: I received this wine as a sample so I could participate in the live tasting from Bin Ends Wine. 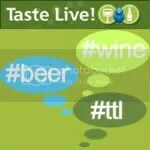 As I mentioned last week, I participated in the Bin Ends Wine Live Twitter Tasting on Thursday. I will also be co-hosting the next round in September, more on that later. Additionally, I was on Wine Biz Radio talking about the experience this morning! Busy busy busy. With that said, I have detailed notes to share with you on the 4 wines we tasted live! The first thing I noted about this wine was the dark straw color. Next I moved on to the nose. The twitter tasting happened in split second timing, so I was typing notes as fast I could smell, and had to go back after the tasting was over to make sure I had covered everything! On the nose I found lemon, stone, spice, honeysuckle, flowers, lime, and orange blossom. I thought the nose was very nice and fairly complex for the price point. In the mouth I found apple, peach, lime, more flowers, nectarines, lemon, and more peach (apparently I really thought the peach was strong). Overall, the wine was really dry, very refreshing, had a full mouthfeel, and was generally extremely well done for the price. I served it with our cheese course and it was great match. This is one I would definitely re-buy!